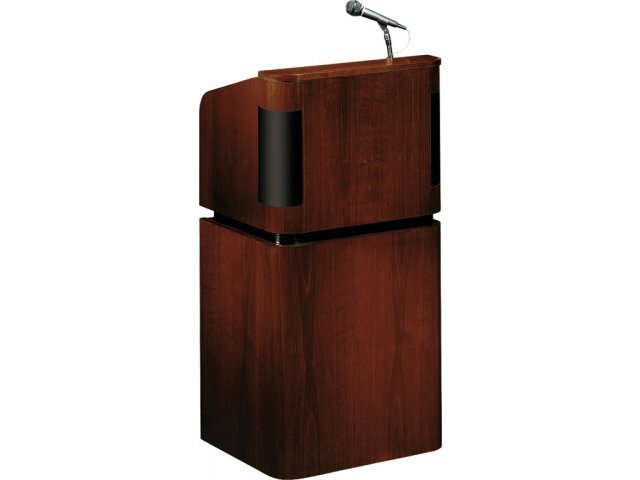 A wireless podium mic gives speakers the freedom to move around and get the message across. 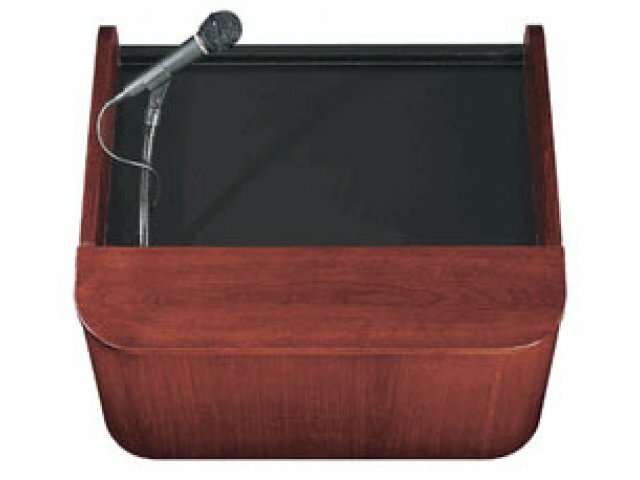 With a choice of three microphone styles, this sound lectern accommodates different preferences. 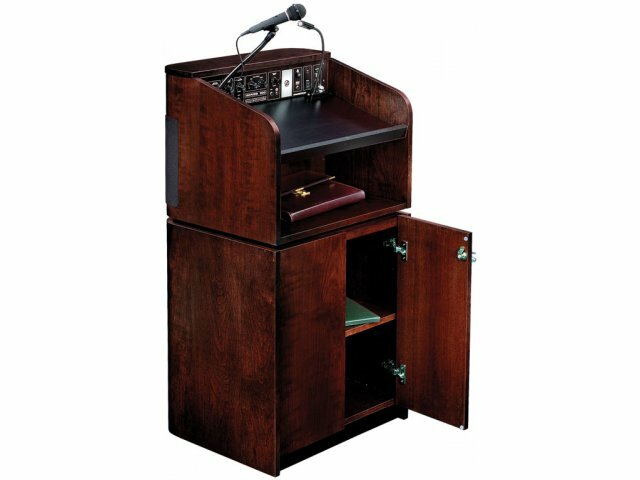 Our Veneer Full-Height Floor Sound Lectern is one of the most powerful sound lecterns you will find. Designed for events where crowds can reach 7,500 people, sound quality is excellent thanks to the custom built-in, 75-watt multimedia amplifier sound system. The sound system incorporates a wireless mic, two wired microphones, plus a line for CD/tape play. Two line-out jacks provide expansion possibilities for additional speakers and tape recording. 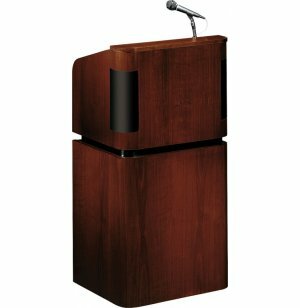 Modern radius curves and contoured edging give this sound lectern a dignified look and enhance the profile of the person speaking. 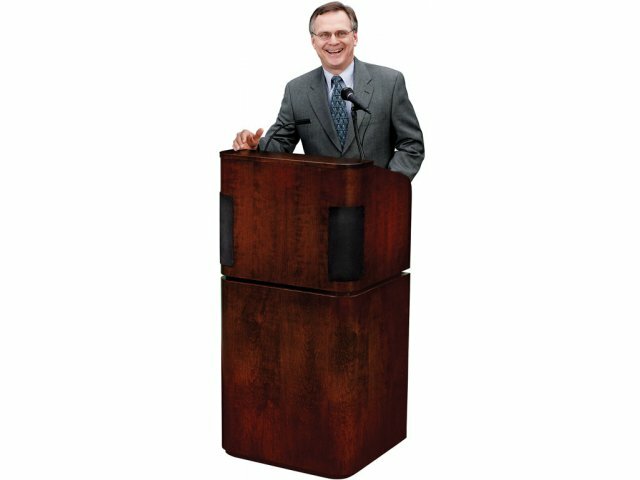 As thousands of eyes are focused on one person, this is a podium that will enhance their stature. The design works well in almost any large auditorium or corporate office. Special features make this a top choice for those hosting special speaking events. 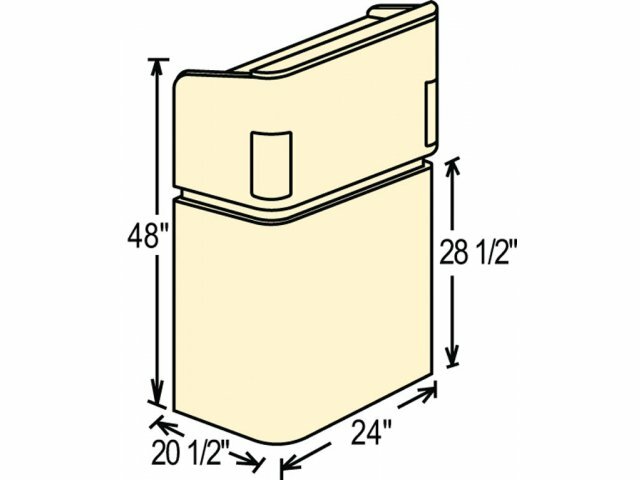 This model contains a concealed reading lamp illuminating a 22"W x 14"L reading surface, a digital timepiece plus a lot of interior locking storage space. Custom built-in 75 watt multimedia amplifier sound system. Broadcast for audiences up to 7,500 people or 75,000 sq. ft.
2 wired microphones included - Handheld with 9' cable and Tie Clip with 10' cable. One line in for CD/Tape play. Two line out jacks provide expansion possibilities for additional speakers and tape recording. Four 4" speakers mounted directly on radius corners. Sound may be customized via the full range of tone controls. AC plug and optional battery operation included. Concealed reading lamp illuminates a 22"W x 14"L reading surface.